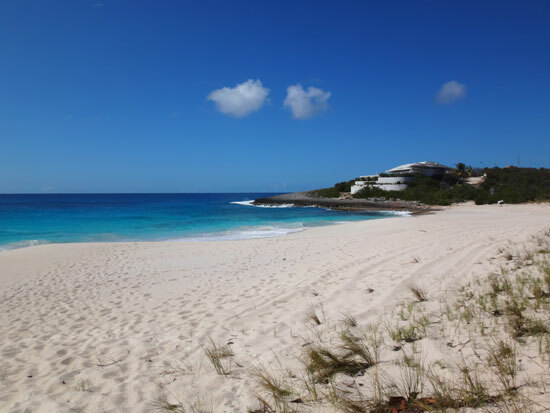 Captain’s Bay… the beach many Anguilla regulars have heard of but few have actually visited. 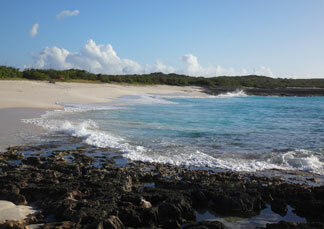 It’s the second farthest beach in the East End of Anguilla and it's very hard to get to. There are no signs leading the way and the road to Captain's Bay is rough. Of those who succeed in experiencing Captain’s Bay, many get hooked and make it a part of their trip each time they come to Anguilla. Why? 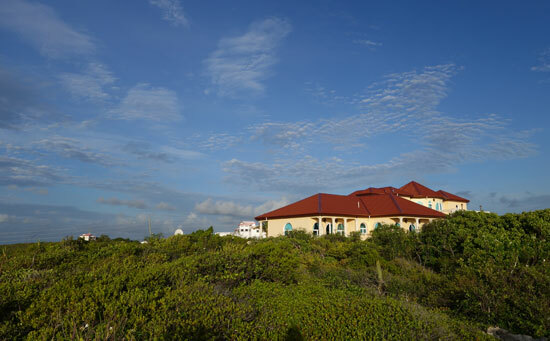 Anguilla is a very private-feeling island. No one place is bustling with people on a regular basis (except for maybe at popular sunset spots or evening gatherings at large resorts in high season). Captain’s Bay is the epitome of privacy. That may be why the only building on the bay is a large villa named, Exclusivity. Take anything you need with you. Nothing convenient is close except for “the bush.” And Exclusivity isn’t exactly open to non-renting guests. If you love the sun, Captain’s Bay is for you. If not, bring any or all of the following: sunscreen, hat, long sleeve shirt, towels, beach umbrella. Pack a cooler with water and beverages, especially if you plan to spend more than a couple of hours. If you don’t have a chair for the beach, the sand is fine enough for a towel directly on it and can be quite comfy. Snacks and food depend on you. Please bring a garbage bag as there are no trash receptacles at Captain’s Bay. Leave only footprints. Tip on Vehicles: SUV recommended. Regular cars can make this trip, but be careful over the rockier parts of the road. If you have been to Captain's Bay, feel free to leave your tips below. There is an “Island Harbour way” and a “Junks Hole way” to get to Captain’s Bay. Here, we highlight the “Junks Hole way.” The “Island Harbour way's” main entry is generally blocked by a boat on a trailer. And, the “Junks Hole way” is a better bet for unobstructed passage and is a little less rough too. 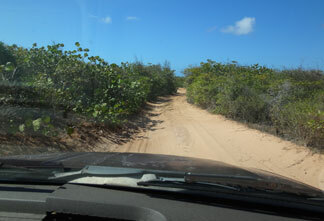 So, get yourself to the East End of Anguilla and to the entrance to Palm Grove, aka Nat’s Place. Follow along that dirt/sand/rocky road as if you are going to Palm Grove. Take the left instead of driving straight down to Nat's. This part is the smoothest part of the trip. and that you can see the sea on the right. You will note the sea is on your right. Note: If you accidentally miss the left and end up at Palm Grove, that’s a fantastic consolation prize. It’s even a good idea to spend some of your time there at Savannah Bay and some of your time at Captain’s Bay. You can get lunch and drinks and use the restroom at Palm Grove too! Getting to Captain’s Bay even for someone who has been is still a matter of feeling your way. Since weather and time change and alter the scenery along the way, you come to rely mostly on the scarce landmarks, lay of the coastline, and sun positioning as a compass, versus the actual roads. The major landmarks I speak of include Savannah Bay, which has several very tall palm trees lining it. 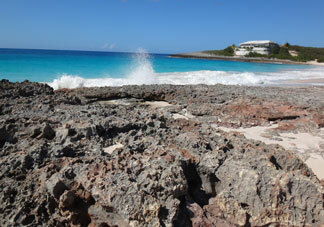 Look for those and know your Anguilla map so you know where that bay is in relation to Captain’s Bay. 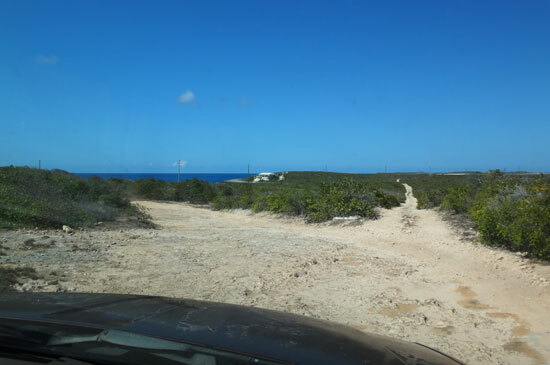 Savannah Bay is on the southern shore of Anguilla and Captain’s Bay is on the north but remember that Anguilla is a narrow island where you can see water on both sides in many spots. With Savannah Bay being to the south and west of Captain’s Bay, keep the tall palms of Savannah Bay in sight as you head mostly east and as you start moving more northerly, they should disappear from sight. At that point you can keep a look out for the copper-roofed home. The copper doesn’t shine in the image on this page as it can to the naked eye under the sun. That home isn’t far from Captain’s Bay and is closer to it than it is to Savannah Bay. If it’s on your left side the entire time, you’re going in the right direction. Another landmark to note: the copper-roofed home (the copper shines bright in the sun). It will be behind your left shoulder if you are on the sand facing Captain's Bay. You'll meet another fork, go left. Note you can see Exclusivity Villa from here. 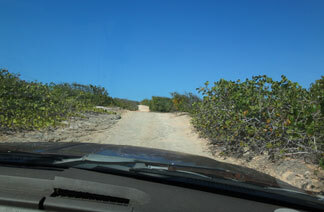 You will go down a slight hill as you are nearing Captain’s Bay and then you will have more feel-your-way options. Next question? Where to park. Exclusivity sits on the far eastern (right) side of Captain’s Bay but you’ll be approaching more so from the western end. 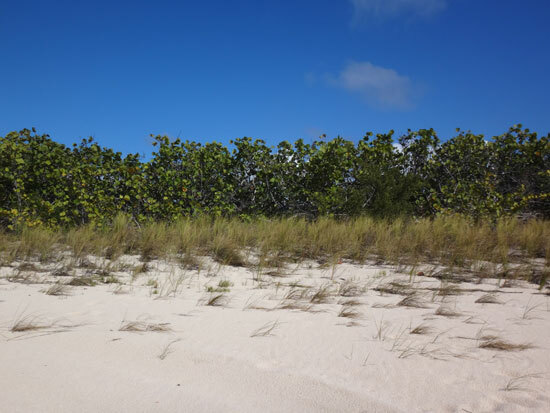 As you see Exclusivity just on the other side of some green shrubs and to the right, you will know that you can start looking for cut-outs on the roadside for parking and walking through to the beach. You will likely feel like parking at the first cut-out you see. That puts you on the rockier western end of the beach. If you drive a little further, toward the east (right), you will see another cut-out just as the road starts to look even rockier. This is where I park. 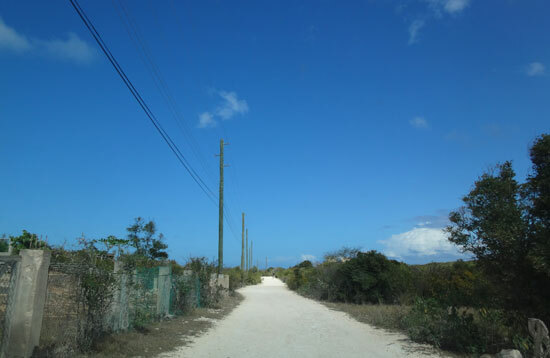 Walk down the rockier road to the opening through to the beach. 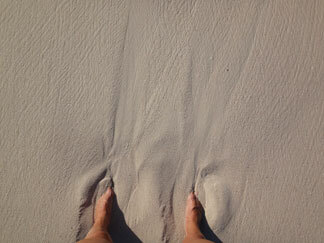 It puts you directly on sand. Tip: The best "fail safe" (to make sure you reach Captain's) is to download the Google Map app to your mobile device. 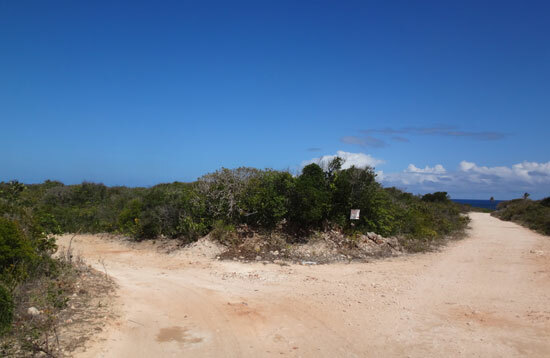 Open a map of Anguilla and navigate to "Captain's Bay" (on "Terrain" mode). Do this before you leave WiFi and keep the app open as you travel. You will be able to see all of the unmarked roads and where your vehicle is traveling on those roads in real time. More on Anguilla maps. You have arrived at Captain's Bay. This is looking north. Captain’s Bay comes with a warning and I’ve heard it from almost every one. It can produce strong currents that can pull you down and under, even if you are in up to your shins. will cover your feet in sand quickly. 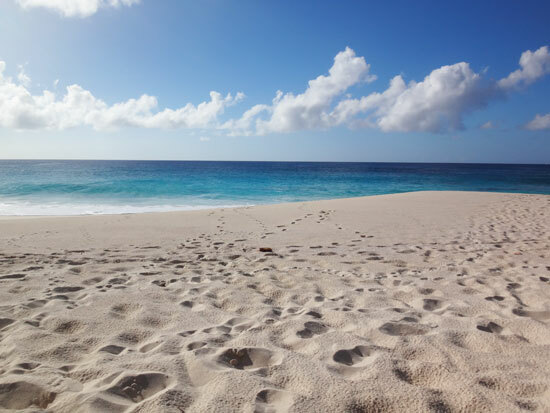 While I have not experienced any trouble, it’s good to be aware of the potential dangers that Captain’s Bay has in comparison to many of Anguilla’s other beaches. I’ve cooled off in Captain’s Bay and I know people who’ve snorkeled in it and swam in it. They are all experienced swimmers. 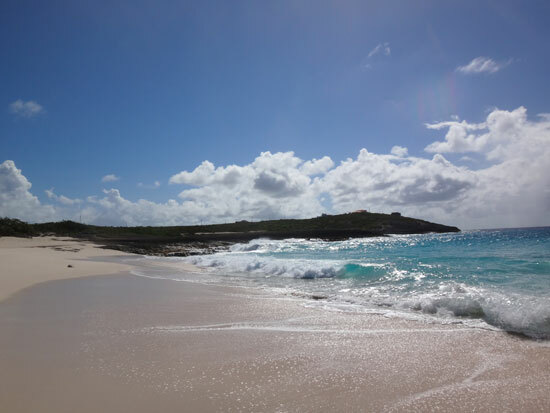 My advice if you want to go in the water at Captain’s Bay is to enter slowly and, since looks can be deceiving, be aware of the current and that this beach is one of Anguilla’s more notorious beaches... it’s not always safe for swimmers. 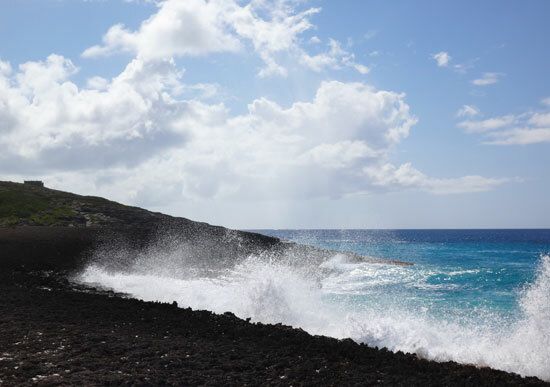 Whether you get in to the water at Captain’s Bay or not, there’s plenty to entertain you if you are an explorer, nature lover or if you just enjoy relaxing. Exclusivity on the hill looks over the bay like a stately, lifeguard without the whistle. The contrast of nothing but nature and that one luxurious man-made structure is nice, I think. I've even seen whales out in Captain's Bay. My friend who so graciously drove us there spotted a disturbance straight out and just outside of the bay. We watched for at least an hour and it seems it was a larger whale and a smaller whale, perhaps mom and calf. After having lived in Anguilla full time for over 5 years and having visited for over 10 years, Captain's Bay was the first place I’d personally seen whales.